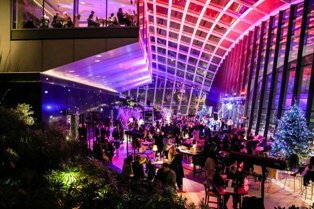 Dance your way into 2019 with Sky Garden’s ‘Studio 54’ celebrations for a night of fabulous food and drink, vibrant live music, and breathtaking views of the Capital. With decadent dining packages in Fenchurch and Darwin Brasserie and a late-night party set against Sky Garden’s tropical gardens; guests will enjoy a glass of Champagne on arrival before dancing the night away with live music from nine-piece party band ‘New City Lights’. So grab your sequins, faux furs, dancing shoes, and finest disco inspired attire, and bring in the New Year with us at Sky Garden! Tickets from £110 per person. For more information and to book, click here.